Mezger’s misfortune, which was nothing new to him, allowed Cote to rocket from the first preliminary fight to the main event. 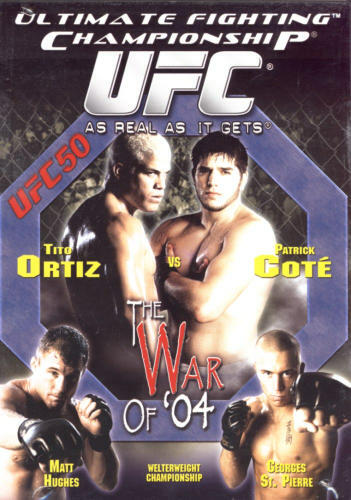 In other action, Rich Franklin used an armbar to beat Jorge Rivera in Round 3; and Frank Trigg earned a welterweight title shot with a TKO win over Renato Verissimo in Round 2. Evan Tanner opened the pay-per-view by defeating “Ruthless” Robbie Lawler with a triangle choke at the 2:22 mark. Lawler is a good example of perseverance, as he won the welterweight title 10 years later at UFC 181. In the preliminary fights, Ivan Salaverry beat Tony Fryklund by submission to a body triangle in 96 seconds; and Travis “The Serial Killer” Lutter knocked out Marvin Eastman in Round 2. Lutter made his Octagon debut after Cote was elevated to the main event.